It's taco night over here and instead of the usual ground beef in taco shells, we're making Chicken Taco Melts using Grands! biscuits! Whenever I cook chicken for a meal, I always make extra and freeze it for a fast weeknight dinner. These Chicken Taco Melts are perfect for using up some shredded chicken. People think that taco seasoning is just for beef, but it tastes great with chicken as well for a lighter option. There are no rules here; you can use whatever taco fillings you love and wrap them in buttery biscuits with some cheese. 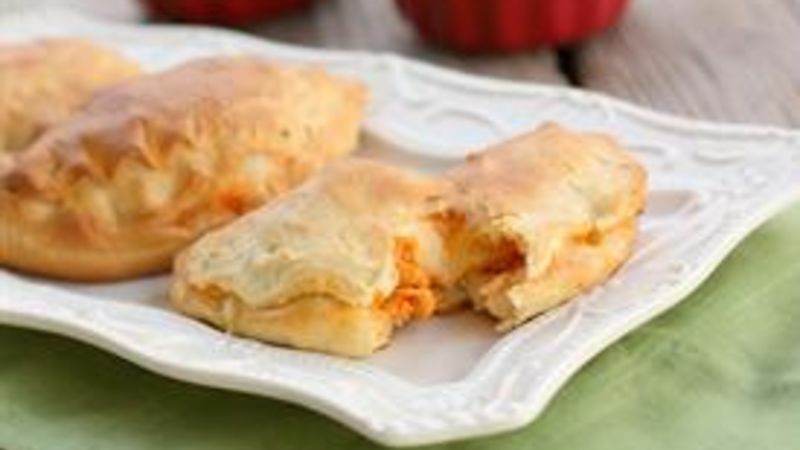 For example, these Chicken Taco Melts are spiced up with some Sriracha sauce, which is so not along the Mexican line but adds a unique twist of hotness and flavor. You could add some black beans, cream cheese, or olives...anything goes! When they've finished they will be nice and golden brown and ready to eat. These totally look like they took forever to make but they're so incredibly easy! If your fam loves tacos, try some of these dishes with taco flavor in fun new forms!